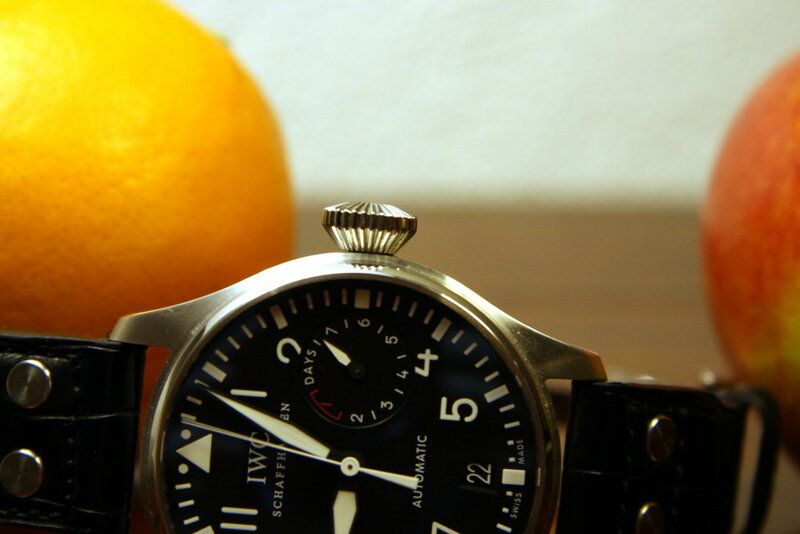 A while ago, I did a comparison of the Breitling Navitimer and the IWC St Exupéry Chrono. 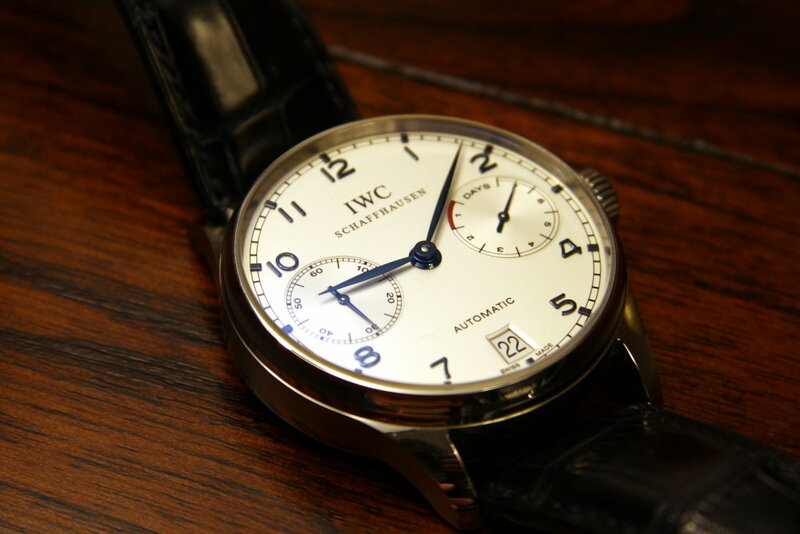 Today, it's time to compare two iconic IWC's, the Big Pilot in steel and the Portuguese Automatic with the white dial and blued hands, also in steel. The anti reflective sapphire crystals are amazing. Most of the times they are almost invisible and the view on the dial is sublime. Reflections are effectively removed by the special coating. 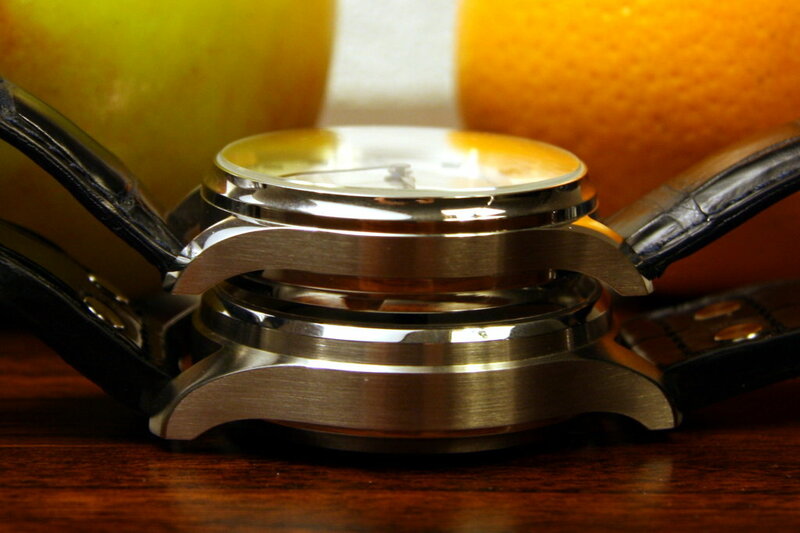 As you can see in the pictures below, it is possible to look at the dial at a very extreme angle. Without anti reflective coating, this is impossible. 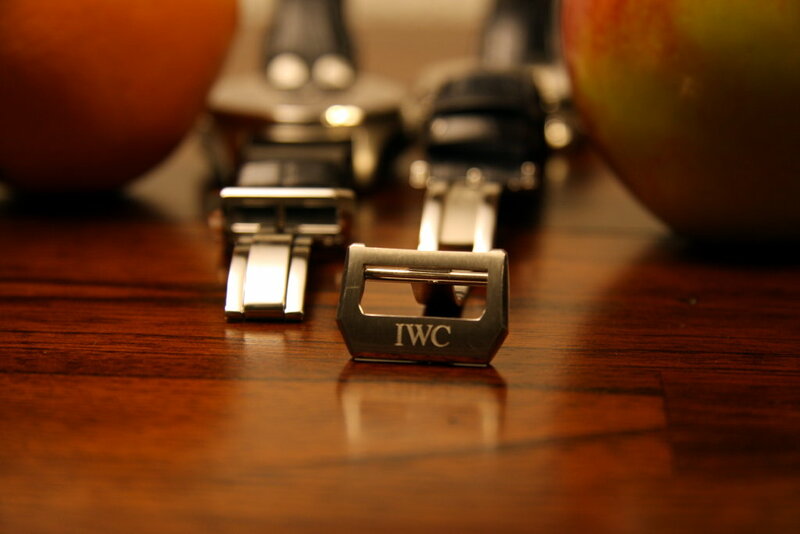 The folding clasps are very comfortable and make it easy to put the watch on and remove it. The straps are available in different lengths. On my Big Pilot I have a short strap, the Portuguese Automatic has the regular size. 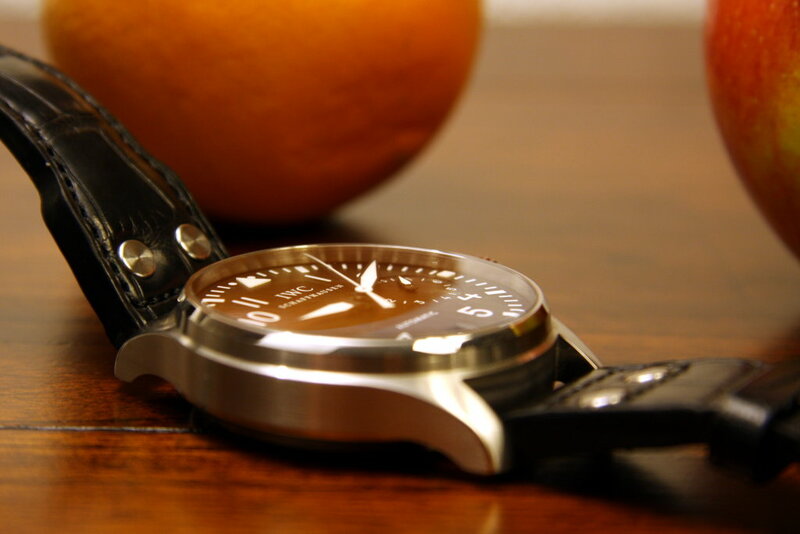 When choosing your watch at your AD, check for the correct position of the folding clasp, it should sit centered on the bottom side of your wrist. 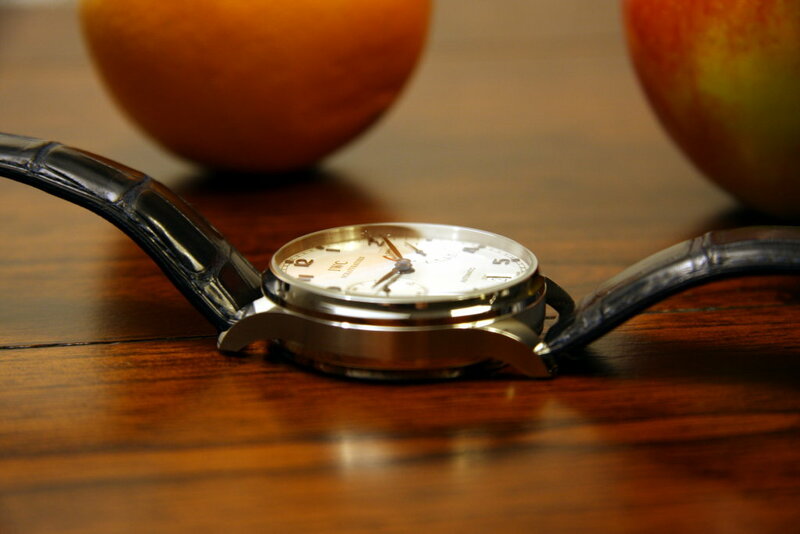 This provides the most comfortable fitting of the watch. If there would have only been similarities, this comparison would quickly become boring but hold on, these watches have plenty of differences too! The case diameter of the Big Pilot is 46,2 mm, where the case diameter of the Portuguese Automatic is only 42,3 mm. A few years ago, the size of the Portuguese Automatic was thought to be huge but times change and nowadays a watch with a case diameter of 42 mm is considered normal or even on the small side. There is a good reason for the relatively big case of both watches, which is the very nice in-house Caliber 5000 movement. 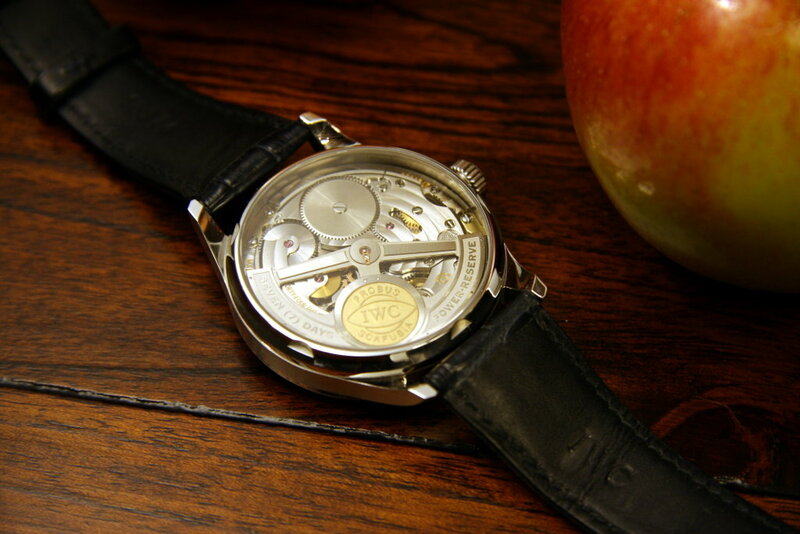 Many watch firms that make large watches fit a small movement in a large case. The easiest way to detect this is with Chronograph models: the hands of the counters seem too close to the center of the dial. 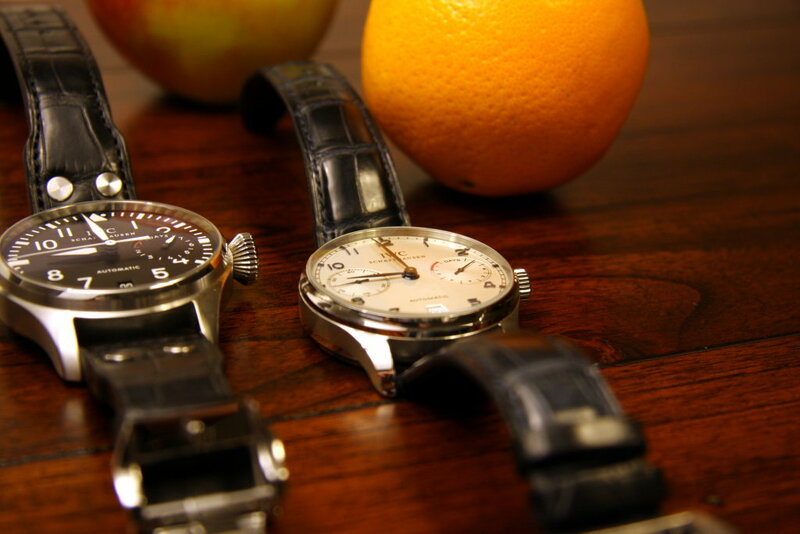 The Caliber 5000 movement however, nicely fills the watch cases of the Big Pilot and the Portuguese Automatic. The reason why the Big Pilot is a few mm bigger than the Portuguese Automatic is because inside the watch case, there is another case of soft iron, effectively protecting the movement from magnetic fields. The case height of the Big Pilot is 15,8 mm, the case of the Portuguese Automatic is slimmer at 13,9 mm. Even though the Portuguese is not a small watch, it easily fits under the sleeves of dress shirts. The Big Pilot might give you a hard time but it's not a watch you want to hide anyway. There is also a considerable weight difference: the Big Pilot in steel weighs 147 g and the Portuguese Automatic only weighs 95 g. Since both watches sit very well on the wrist, the bigger weight of the Big Pilot doesn't bother me. 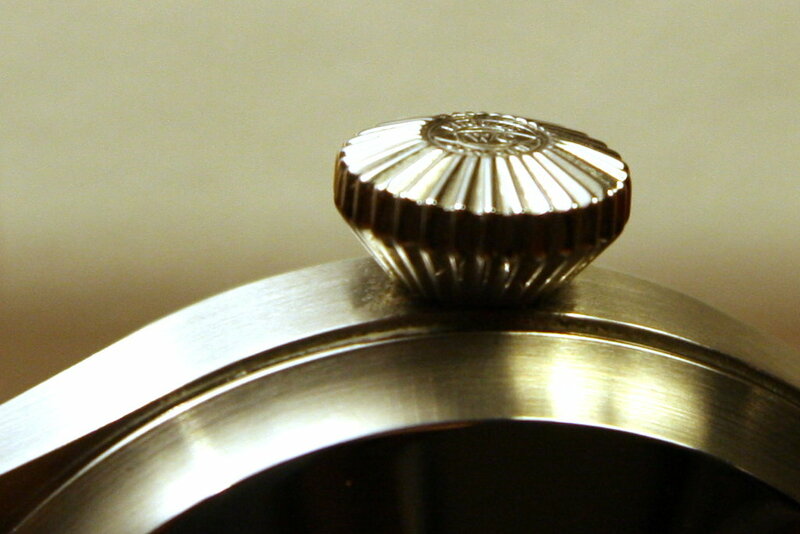 Both watch cases come with brushed and polished parts. 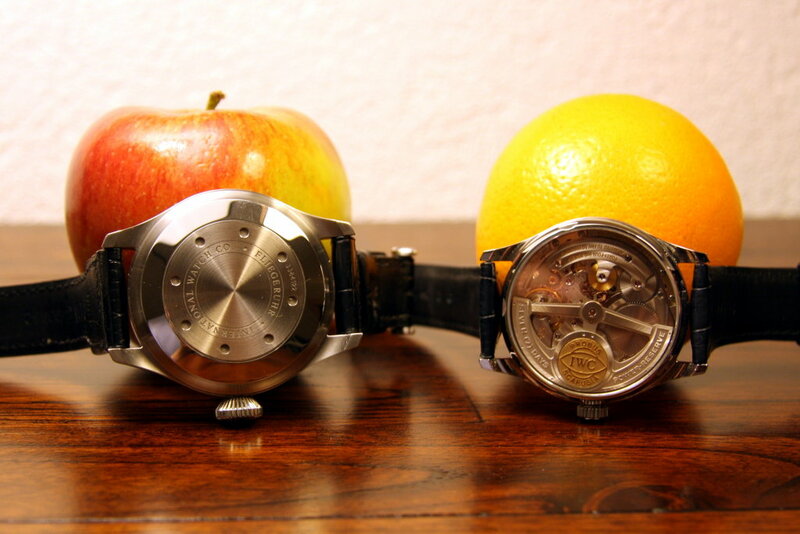 The combination works very well, the watches are not too shiny and not too dull either. 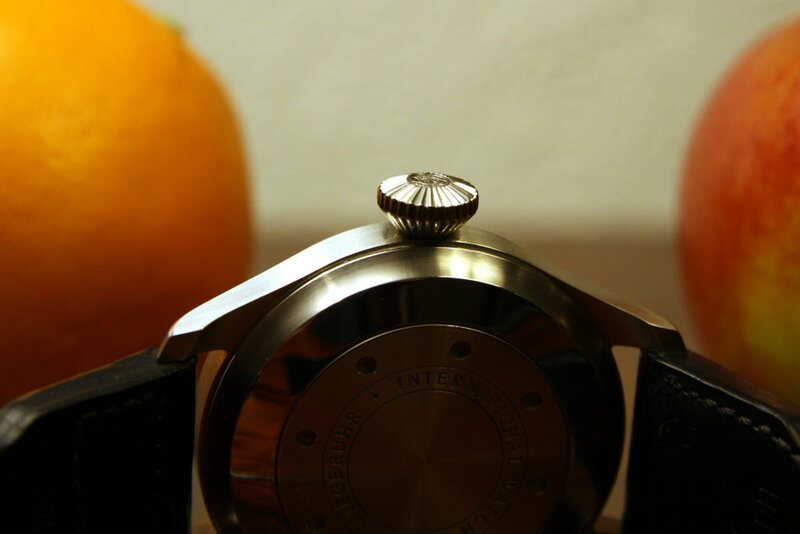 In the picture below, you can see that the crystal from the Portuguese Automatic raises above the steel case. Many watches have a rather large bezel but the bezel from Portuguese Automatic is very slim, offering a huge dial. It makes the watch look bigger than it's 42,3 mm. The crystal of the Big Pilot is secured against displacement by drop in air pressure, a detail found on all Pilot's watches from IWC. A beautiful detail on the Big Pilot is the crown, which gives the watch much of its character. It is a screwed crown, which helps to give the watch a water resistance rating of 6 bar, compared to 3 bar for the Portuguese Automatic. 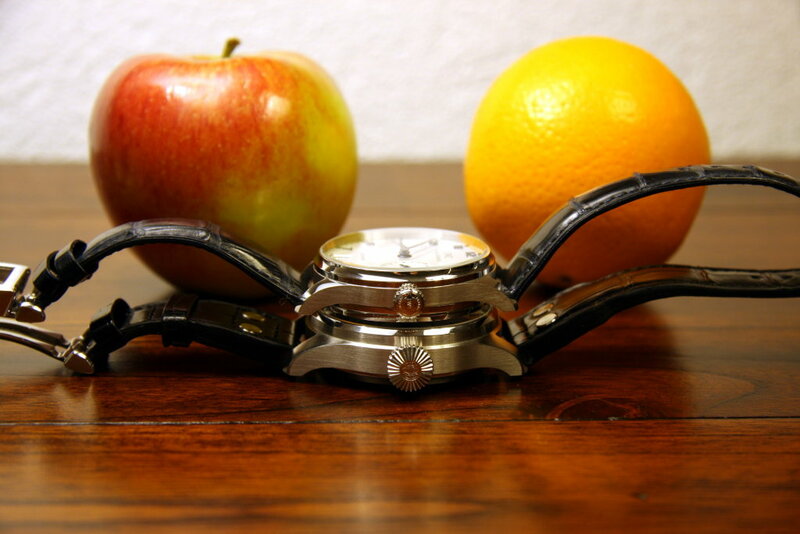 The big crown has another advantage: it makes it easier to wind the watch and set the time and date. 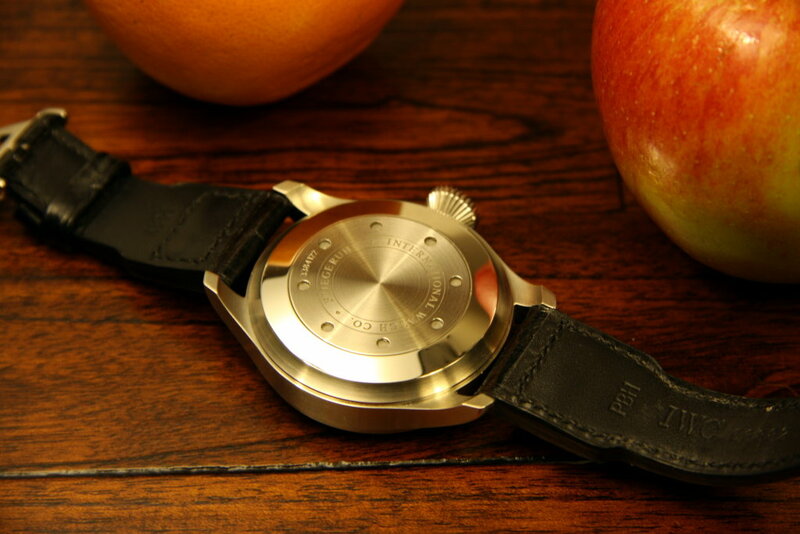 The Caliber 5000 movement has a quick set date function. With a power reserve of seven days, chances are slim that the watch will stop so the quick set date function probably won't be used extensively. Since both watches come on croco straps, I keep them clear of water. The source for the straps might have been a good swimmer, I prefer not to ruin the rather expensive straps. Manually winding the Caliber 5000 movement is very smooth. Since the crown of the Big Pilot is bigger than the crown of the Portuguese Automatic, it feels even smoother to wind but winding the Portuguese Automatic is easy enough. Even though both watches come with the Caliber 5000 movement, there are a few visible differences: the movement in the Big Pilot comes with a central second hand where the movement in the Portuguese Automatic has a small second hand at 9 o'clock. Together with the Power Reserve display at 3 o'clock, this gives the Portuguese Automatic a very nice symmetry and it is very recognizeable. The central second hand on the Big Pilot is very nice and more fitting for a Pilot's watch. Both the second hands on the Portuguese Automatic and the Big Pilot allow for 'hacking'. This means that the second hand stops when you set the time of the watch. This allows for accurate time setting. The numerals on the dial of the Portuguese Automatic are not painted as on the Big Pilot but they are applied, 'appliqué' in watch terms. The hands on the Portuguese Automatic are made from blued steel. The blue color appears when the metal is heat treated in a special way. The biggest difference is on the back of the watches though: the Big Pilot comes with a massive, solid case back, covering the inner watch case of soft iron. The Portuguese Automatic comes with a magnificent sapphire display back almost the size of the entire back and this provides an excellent view of the Caliber 5000 movement. 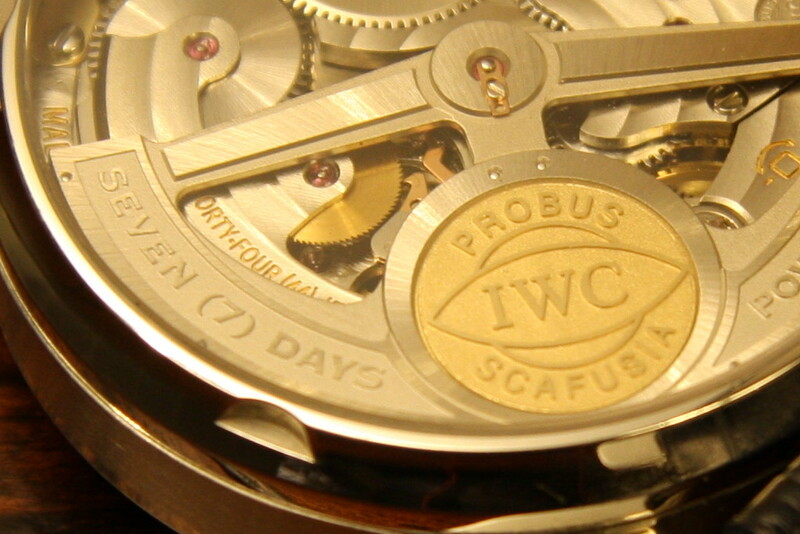 The Caliber 5000 movement comes with the patented Pellaton winding system which can be seen in the picture below. 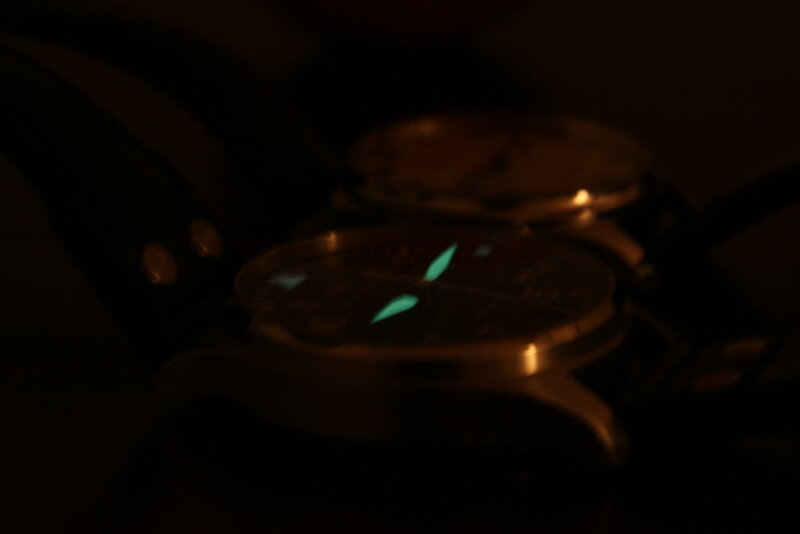 A Pilot's watch can also be used when it is dark. At night in the cockpit, there is not much light because it will hinder the view outside. To be able to tell the time, the Big Pilot comes with Superluminova on the hour- and minutes hand and on the markers at 12, 3, 6 and 9. 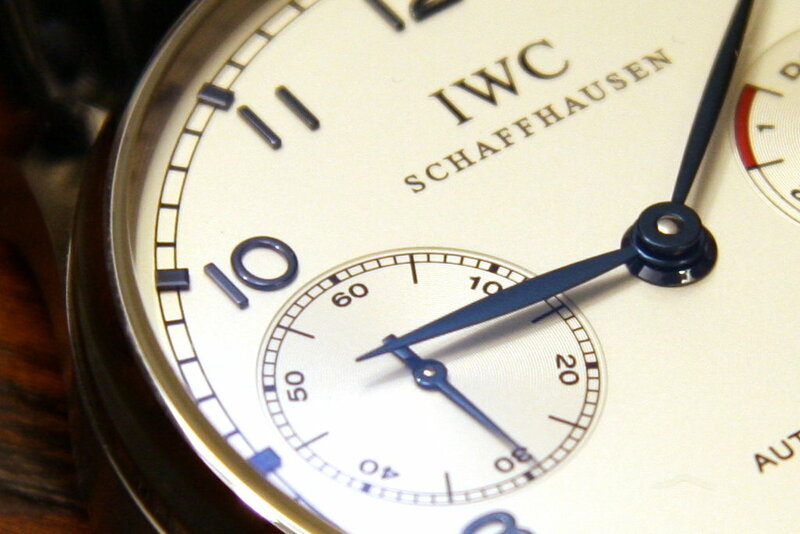 The Portuguese Automatic on the contrary comes without luminous material on the dial. 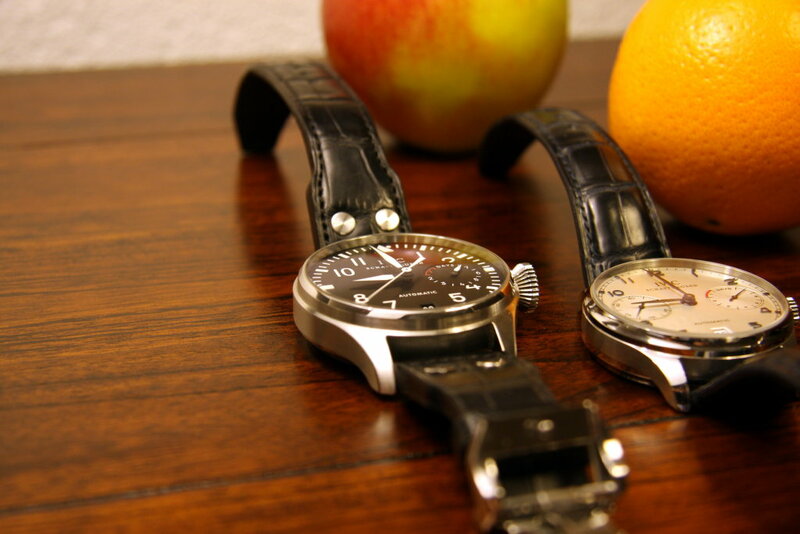 Both watches are great and have a completely different look and feel. The Portuguese Automatic is more of a 'dress-watch' than the Big Pilot. 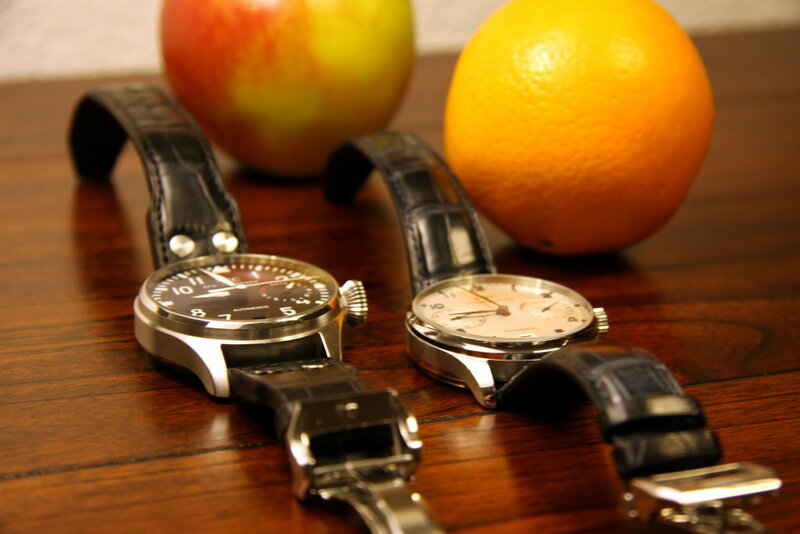 It goes very well with a jeans and shirt too, making it a watch that can be worn in almost all circumstances. The Big Pilot is a watch that doesn't go unnoticed. It gets most of the compliments I get about my watches and it is one of my favorites. 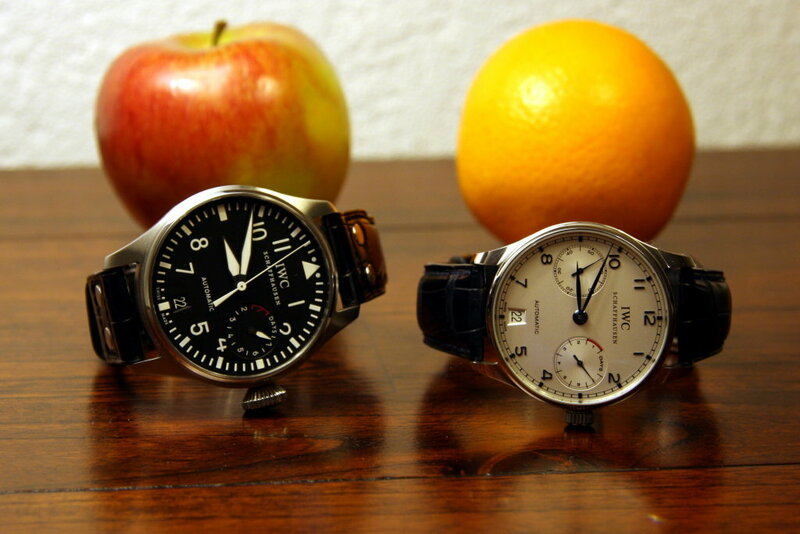 From what can be found on the Internet, both the Portuguese Automatic and the Big Pilot are considered two of the icons of the current watch collection of IWC. I am very happy to own both and enjoy wearing them. If you can afford to own both, I think they are a very nice combination. In case you want to swim or shower with your watch, I suggest you get an Ingenieur or an Aquatimer too, the croco straps will thank you for that.